She doesn’t know how he knows her, but with those words Kimber knows this stranger isn’t after anything as simple as her money or artwork or charming Craftsman bungalow. She has to find out exactly what he wants and get him out of her carefully orchestrated life before he ruins it. There are plenty of people in her life who might help, but should Kimber trust any of them? Her lawyer, Gabriel, is also her ex-lover; Diana, her best friend, doesn’t know Kimber slept with her husband; her ex-husband has a new, happier life since leaving her; and her co-workers know she’ll do anything to get her next sale. And no one can know the real reason this man is in her house. Without trust, everyone’s a stranger…. My thanks to Mulholland Books and NetGalley for sending me an ARC of this book in exchange for an honest review. All opinions are my own and are not influenced by the publisher. Kimber is habitually dishonest and selfish. A lot of this seems to come from her traumatic past, but I can only give a character so much leeway for that, and Kimber pushes the limit. She’s emotionally distant in relationships, but don’t worry, she has a foolproof plan for dealing with that: she just sleeps with married men! No strings! This was bad enough, but I can look past it in a fictional character to an extent. Kimber takes it to another level, though, when she decides to befriend the wife of one of her former flings, purely because she think it’ll be funny to unnerve him. The wife’s feelings don’t seem to cross her mind for a minute. The second deal-breaker for me was the ridiculously convoluted plot. Some thriller writers seem to think that they can create an engaging story by the sheer quantity of twists. Quality, not quantity, please. 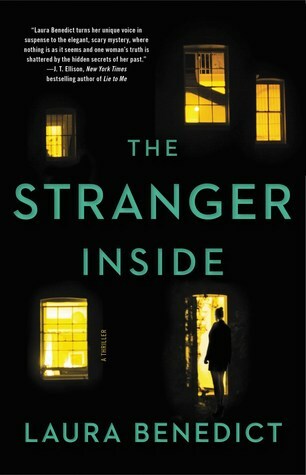 Yes, if you throw in enough twists, at some point every reader is going to say, “Well, I didn’t see that coming.” The Stranger Inside is almost guaranteed to surprise you at least once, but this is in part because the twists are ridiculous. Obviously, I can’t go into detail here without veering into spoilers, and maybe your experience will be different, but I wasn’t buying some of these plot points. Clearly, this novel didn’t work for me, but the creep factor behind the basic concept is super intriguing, there are loads of characters to suspect, and I do think there’s an audience for this book. This might be a good choice for fans of The Night Olivia Fell, When the Lights Go Out, and The Wife Between Us. Thank you for reading! What’s the best thriller you’ve read lately? I need some recommendations after this! Give me complex characters and well thought-out twists! I can’t stand cheating main characters when we are seeing story from their point of view . I have DNFd a lot of books because of that . Not one for me. One of the best psychological thrillers I have read is Disclaimer by Renee Knight which begins with a woman discovering a book she cannot remember buying on her beside table detailing a incident in her life that she thought no one else knew about. I even stayed up until 3 am to finish it. Oooh, i haven’t heard of that one. Sounds seriously interesting! Not pleasant in parts but absolutely gripping. The resolution was unexpected too. Great review. I think I’ve also gotten more picky about thrillers lately, and this one sounds like a disappointing mess. Too bad, because the premise sounds so intriguing. I hope you have better luck next time!